Does Using Hands-Free Devices While Driving Make You Safer? In Colorado, drivers younger than 18-years-old are banned from driving with a hand-held device, but a stricter mobile device ban that would have made it illegal for all Colorado drivers to use a handheld device while driving was voted down. Multitasking, the idea that a person can do two things at one time and do them accurately or sufficiently, is a concept central to modern living. But, despite popular opinion, for years researchers have noted that humans are not good at doing a few things at once, not even two things at once. That fact is why safety officials are concerned that our roads are becoming less safe despite all the high-tech inventions integrated into vehicles that are supposed to make us safer. Cellphones and other mobile devices remain the greatest safety issue. According to the National Highway Traffic Safety Administration (NHTSA), at any given time during the day, more than 480,000 people are driving and using a cell phone at the same time. It’s hard to imagine this, but that number is an improvement from 2012 when an NHTSA survey showed approximately 660,000 people were driving and using a cell phone at the same time on a daily basis. Because some states have established laws against using mobile devices behind the wheel, drivers sought out hands-free options, such as Bluetooth, headsets, and earbuds, believing them to be a safe alternative to active cellphone usage. In response to the trend, the National Safety Council (NSC) has firmly declared that multitasking is a myth, and it has nothing to do with individual ability, it has everything to do with the human brain. The NSC explains this concept even further by noting that when human brains are toggling between tasks, the brain’s capacity to process moving images decreases by one-third. NSC research has also shown that when a driver is talking on a cell phone, regardless of whether it’s handheld or hands-free, that driver fails to see up to 50 percent of what is occurring outside the front windshield. The fact that the NSC says the majority of auto accidents are caused by a distraction rather than by mechanical or external issues should convince everyone that the best way to truly make driving safe for you and others, is to put the phone down and not use it in any mode while driving. 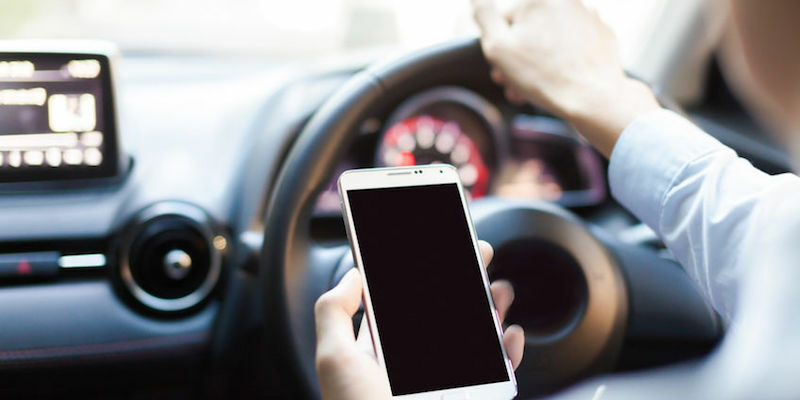 Since the explosion of smartphones occurred years ago, states are now becoming more proactive when it comes to passing laws against their use while driving. Here in Colorado, drivers younger than 18-years-old are banned from driving with a hand-held device, but a stricter mobile device ban, one that would have made it illegal for all Colorado drivers to use a handheld device while driving, was voted down. For those in states where there are strict driving and texting laws, voice-activated text messaging has become more popular. The Texas A&M Transportation Institute studied three groups of drivers — those who just drove, those who drove and texted, and those who drove and used voice-activated text, in a controlled environment — and the results were a bit surprising. According to an article on the study, the results showed that regardless of the texting method, either manually or verbally, driver response to road conditions was two times longer than those who were driving and not using a mobile device. The bottom line here is that the NSC is on the right track when it says that despite what humans believe, multitasking safely and efficiently is difficult at best. So for everyone’s safety on the road, do not use your mobile device once you’ve gotten behind the wheel. Do not check it. Do not answer it. Do not acknowledge it until you have reached your destination.